“Franchising is good for veterans, and veterans are good for franchising." The Dwyer Group announced that its brands were ranked in the top 10 percent of all franchises nationwide and named on the 2013 Military Friendly Franchise® list by G.I. Jobs Magazine for the third consecutive year. The Dwyer Group is a series of service-based companies known for its depth of support services, respected management team, commitment to the company’s Code of Values®, and the success of its franchises. The company’s brands: Aire Serv®, Glass Doctor®, Mr. Appliance®, Mr. Electric®, Mr. Rooter®, Rainbow International®, and The Grounds Guys® honor military veterans all year round by offering service members 25% off the initial franchise fee, allowing veterans to use their training and operational skills in a new civilian career. “Franchising is good for veterans, and veterans are good for franchising. With more than 200,000 veterans transitioning to the civilian world each year, we owe it to them to offer this opportunity,” said Mary Kennedy Thompson, former Marine, VetFran Chairwoman and president of Mr. Rooter Plumbing. For information on opening a franchise, please visit http://www.leadingtheserviceindustry.com. The Dwyer Group, Inc., based in Waco, Texas, is a holding company of seven franchise businesses, each selling and supporting a different franchise under the following service marks: Aire Serv, Glass Doctor, The Grounds Guys, Mr. Appliance, Mr. Electric, Mr. Rooter (Drain Doctor in the UK and Portugal), and Rainbow International. Collectively, these independent franchise concepts offer customers world-wide a broad base of residential and commercial services. In addition, Dwyer operates glass shops in New England under the Portland Glass brand name. The Dwyer Group is a portfolio company of TZP Group LLC, a private equity firm based in New York that focuses on control investments in business and consumer services companies with enterprise values generally up to $200 million. More information on The Dwyer Group, or its franchise concepts, is available at http://www.dwyergroup.com. 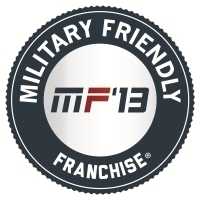 The full list of Military Friendly Franchises® is published each June in G.I. Jobs Magazine, and on http://www.MilitaryFranchising.com, a web tool that helps veterans decide which franchise to choose. Additional resources are posted on the Military Friendly Franchises® Facebook page: http://www.facebook.com/MilitaryFranchising. G.I. Jobs (http://www.gijobs.com) is published 12 times per year by Victory Media, a veteran-owned business. The company also publishes The Guide to Military Friendly Schools®.